Vaqueros catcher Alonzo Rubalcaba (No. 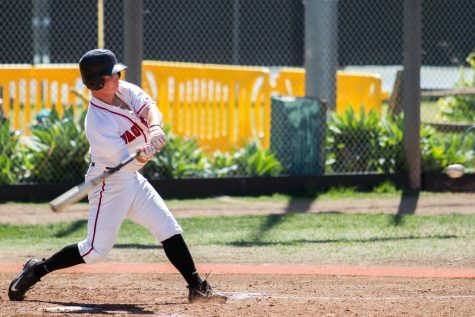 15) rips an RBI single into right center field to cap off a seven run second inning on Saturday, April 13, 2019, at Pershing Park in Santa Barbara, Calif. The Vaqueros won the game 11-9. 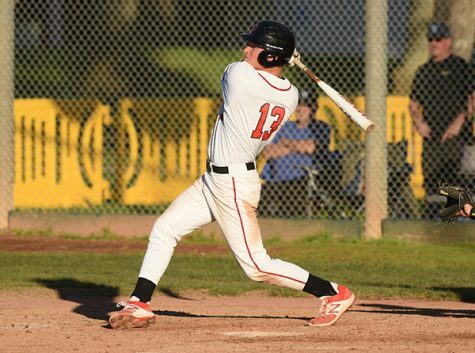 The City College baseball team defeated Oxnard College 11-9 Saturday afternoon at Pershing Park behind an early offensive explosion led by designated hitter Benjamin Martz. 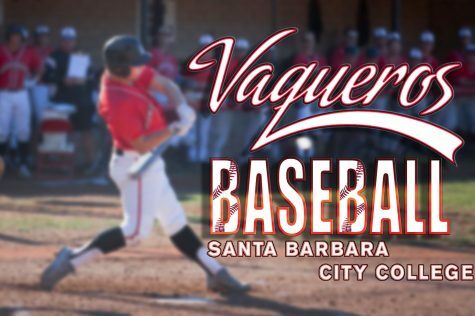 Martz opened the scoring with a solo home-run over the left field fence in the bottom of the first inning, giving the Vaqueros a 1-0 lead. He said after the game that he was trying to embody what his coach, Jeff Walker, calls “Blair’s 3 a.m. hot sauce.” Named after a particularly spicy hot sauce, Walker uses the term to describe a mindset of playing aggressively right out of the gate to score first and put the opponent on their heels. Oxnard’s pitcher hit the first batter with a pitch and walked the second before allowing a single by center fielder Boston Hubbard that loaded the bases with no outs. 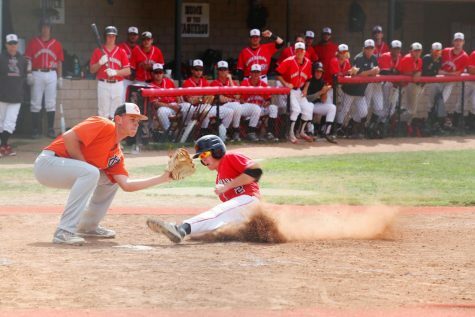 First baseman Jacob Bravo started the inning’s scoring, knocking a line drive past the Oxnard second baseman’s outstretched glove for a one-run single. 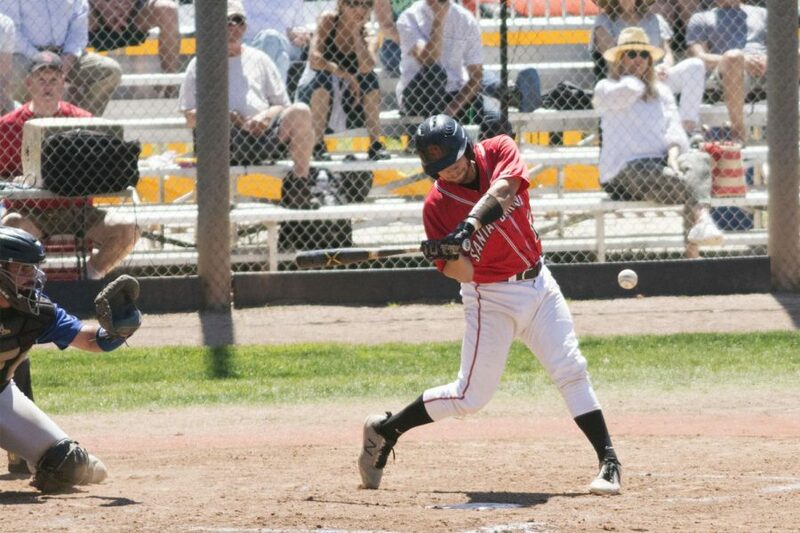 Third baseman Logan Pollack followed with a single of his own, sending two more base runners home. 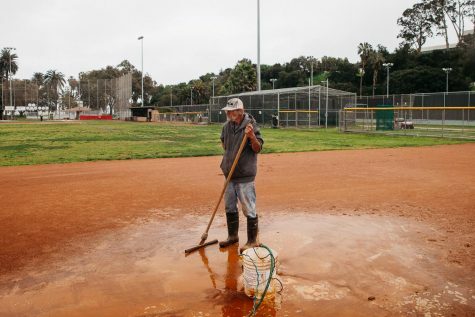 A controversial passed ball call added some tension to the inning, with Oxnard head coach Steve Hernandez arguing loudly with the umpire over the decision. After taking the debate a step too far, he was ejected from the game to cheers from the City College home crowd. After the win City College head coach Jeff Walker was asked how the ejection affected the game. 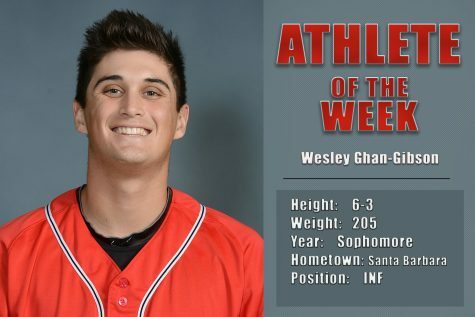 Immediately after the incident, another walk loaded the bases again and second baseman Tommy Holguin hit into a fielder’s choice that scored another run. With runners on first and third base, Martz walked up to the plate for the second time. This time he built on his hot start by ripping a deep triple to center field, scoring two more runs. 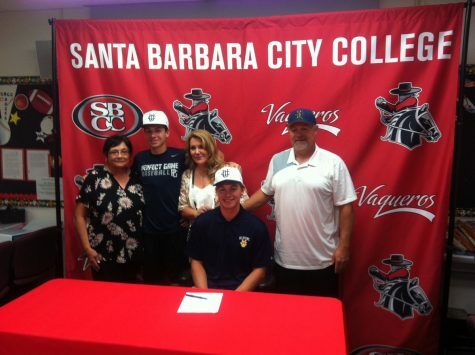 A single by left fielder Patrick Caulfield brought Martz home, and completed the scoring in a whopping seven-run inning for the Vaqueros. The score was 8-3 in favor of the home team entering the third. Ian Churchill replaced Aldrich on the mound in the third inning, and pitched well for most of the game. 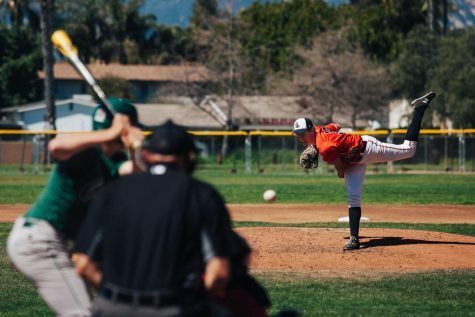 Churchill began to lose some steam near the end of the game, letting Oxnard bring the game dangerously close as a run of hits turned an 11-5 ninth inning lead into an 11-9 ball game with two players on base. Relief pitcher Jake McBride was brought in for Churchill, and he closed out the game with two quick outs to seal the victory for the Vaqueros. Afterwards, Martz credited the late-game play of both pitchers for holding on to the win. Walker focused his praise on the offense. “We came out swinging the bats well,” he said. The City College baseball team will play its next game on the road against Pasadena City at 2:30 p.m. on Tuesday.